In this paper, we look at phenotypes and genetics and find that this dual origin explanation is probably true. Dom, Eben, and Pamela went to Kauai to photograph, record to and collect DNA from the chickens. (I stayed at home and did sequence bioinformatics.) 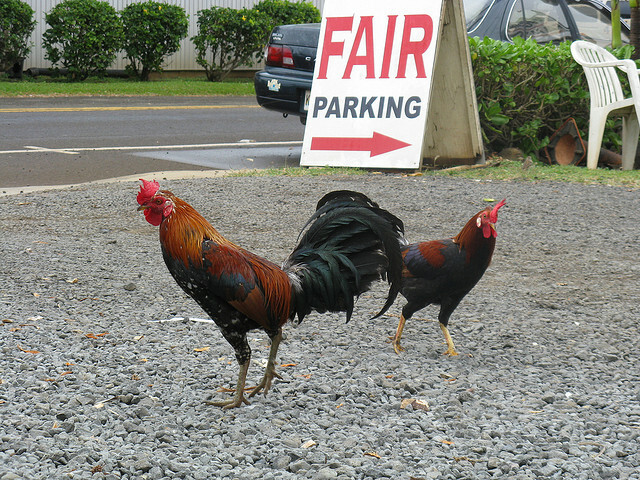 The Kauai chickens look and sound like mixture of wild and domestic chickens. Some of them have the typical Junglefowl plumage, and other have flecks of white. Their crows vary in the length of the characteristic fourth syllable. Also, some of them have yellow legs, a trait that domestic chickens seem to have gotten not from the Red but from the Grey Junglefowl. We looked at DNA sequences by massively parallel (SOLiD) sequencing of 23 individuals. We find mitochondrial sequences that fall in two haplogroups: E and D. The presence of the D haplogroup, which is the dominating one in ancient DNA sequences from the Pacific, means that there is a Pacific component to their ancestry. The E group, on the other hand, occurs in domestic chickens. It also shows up in some ancient DNA samples from the Pacific, but not from Kauai (and there is a scientific debate about these sequences). The nuclear genome analysis is pretty inconclusive. I think what we would need is some samples of possible domestic source populations (Where did the escapee chickens came from? Are there other traditional domestic sources?) and a better sampling of Red Junglefowl to make better sense of it. When we take the plumage, vocalisation and mitochondrial DNA together, it looks like this is a feral admixed population of either Red Junglefowl or traditional Pacific chickens mixed with domestics. A very interesting population indeed. Kenneth Chang wrote about the paper in New York Times; includes quotes from Eben and Dom.